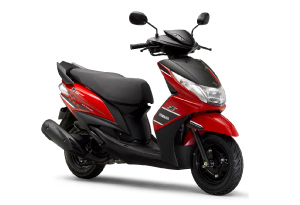 Release of the "CYGNUS RAY Z," Yamaha's second scooter for the Indian market - News Releases | Yamaha Motor Co., Ltd.
Yamaha Motor Co., Ltd. announces the May 2013 release of the new "CYGNUS RAY Z" as the Yamaha brand's second scooter model for the Indian market. 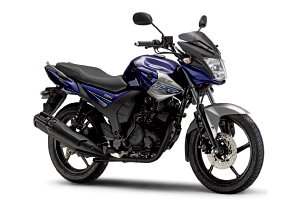 This model will be manufactured and marketed by Yamaha Motor group company India Yamaha Motor Pvt. Ltd. (IYM). The CYGNUS RAY Z is a model developed to target young male users in their late teens and early twenties with its concept of "Aggressive Sporty Design." It keeps the same basic performance of the "CYGNUS RAY" model released in September 2012 while giving it a sporty look and feel with 1) a smoked-finish visor for a motorcycle-like image, 2) aluminum rear wing-shaped tandem rider grab-bars, 3) a new instrument panel with a carbon fiber patterned background, 4) a carbon fiber patterned seat cover material, and 5) dynamic coloring and graphics. The new model adopts the same air-cooled 115cc engine as the CYGNUS RAY with its smooth start-up acceleration and good pickup. India's motorcycle market surpassed China's in 2012 to become the world's largest with an annual demand of approximately 14 million units (Yamaha Motor survey), with especially rapid expansion of the scooter category in recent years. Partly in response to the growth in demand for scooters from an increasing number of women turning to them for personal mobility in India today, Yamaha developed the CYGNUS RAY to target young women. Since its release last year, its signature compact size and ease of use has made the CYGNUS RAY popular not only with women but with men as well, resulting in sales of about 70,000 units as of the end of April 2013. In India, where market growth is expected to continue, the release of the new CYGNUS RAY Z specifically targeting male users gives Yamaha a stronger scooter lineup to expand and increase sales. June 2013 will see the release of two new model variations in the Yamaha SZ sport model series named the "SZ-RR" and "SZ-S." The SZ-RR is defined by the sporty styling and look of quality in its exterior design with special features like its smoked windscreen, aluminum grab-bars and 3D "SZ" emblem. The SZ-S features a simpler design in the fuel tank that creates a calmer, more composed impression that will also be appreciated by all members of a family.